One night to solve the world's problems! For seven geniuses, they have no choice. A terrorist calls together a scientist, a seminary student, a pro baseball player, a professor, a casino owner, a painter, and a pizza delivery guy to attempt to solve the world's problems. 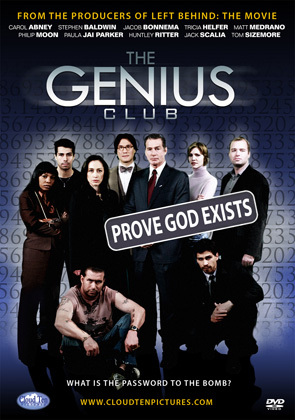 Seven geniuses, with IQs over 200, are plucked from their lives on Christmas Eve to try to solve the world's problems in one night. If they fail, the world will come to an end. The group attempt to solve world hunger, war, cancer, terrorism, rush hour traffic, jerks, and finally the meaning of life. By morning, the group finds redemption in themselves and quite possible the world. This Thriller is rated PG for thematic elements and some disturbing content. The cast includes: Stephen Baldwin (Six: The Mark Unleashed), Tom Sizemore (Saving Private Ryan, Black Hawk Down), Tricia Helfer (Battlestar Galactica TV series), Philip Moon (The Big Lebowski), Jack Scalia (Red Eye), Paula Jai Parker (Hustle & Flow), Carol Abney, and Huntley Ritter (We Are Marshall). This film is based on the best-selling book series of the same name. This film is based on a best-selling book series of the same name. In this ever-changing world, The Saddle Club will always have each other. What was the point of this movie? Why do producers think we like to watch stuff in darkness. I watched it on TBN on a flat screen HD and the sound was terrible as well as the picture quality. Why can't christians make a good movie? Search yourselves about this. Hollywood made Ben Hur (a fictional character) and the Christo figure was so wonderfully portrayed therein without a single preaching slur. Can someone tell me what was to be gained from this waste of time? Really I don't want to be facetious but I know I sound like I do. Really badly produced with zero content. This movie brings on a serious gut-check. It truly makes you question yourself & ponder several aspects of humanity. No, it isn't the most "pleasant" movie per se. It IS a *very* well-made film with a great cast that delivers! It will keep your mind & heart occupied as well as entertain you & keep you on the edge of your seat. I hope you enjoy it as much as I did! i really wanted to like this movie, because of steven baldwin. but honestly? i couldn't even watch it all. it bored me. it was dark, depressing, and just utterly boring. This film raises many questions about life. What is the purpose of life? the bible student was weak, when responding to the group with the answers. He stated the gospel, but it seemed to be absent of the power of the Holy Spirit. Over all the film, left a vacuum of the purpose of life. And ended with i am with the focus on man; humanism. There was no repentance fo sin, or anyone turning to Christ for salvation. And no stronge answer to the question why? gift of God is eternal life in Christ Jesus our Lord. the film had another gospel it was preaching humanism. Good thought provoking message, a little confusing a times though. I really thought this film was going to be boring, but It was really brillant, Intelligence behind it & smarts. The beginning was slow & kind of boring, but it immediatly went good. I ended up falling asleep near the end. I hated I missed it. It came on last night on TBN. Another good film. This was a great movie, and one that made you think. The acting was good and the story was a believable one with a very suprising ending. The movie kept your attention and I was very happy with it.